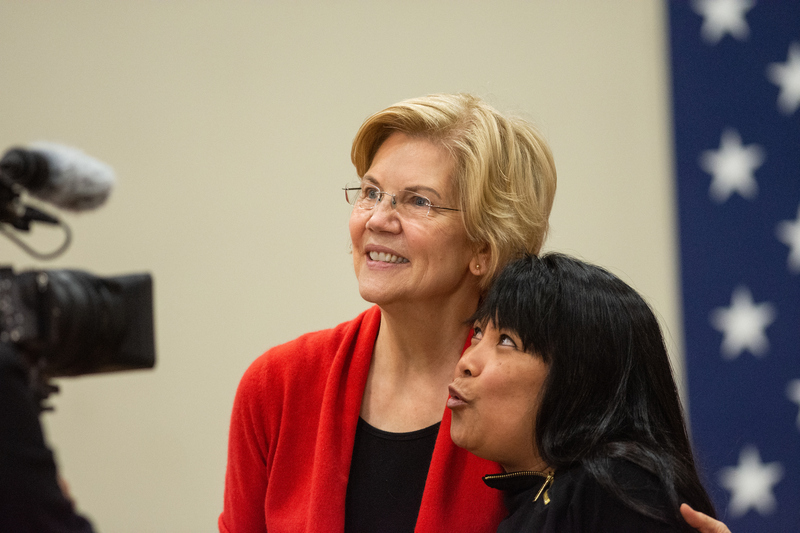 Warren, who visited Reno for a campaign rally on Saturday, told The Nevada Independent that while she doesn’t believe there should be more federal regulation of gaming generally, online gaming “presents a whole new set of challenges” beyond traditional casino-based gaming. The Massachusetts senator said that similar to online payday lending, a practice she has been vocal about reining in, online gaming poses challenges difficult for states to address on their own. Warren wouldn’t say whether she would support a ban on online gaming, which the Department of Justice moved toward earlier this year when it issued an opinion expanding the scope of a law barring interstate gaming. Some industry experts have said the opinion ignores a long history of effective state regulation. But Warren said she wants to hear more from stakeholders on the issue first. Warren’s comments on online gaming came in a brief interview with the Independent shortly before her first Northern Nevada rally since formally launching her campaign for president. Roughly 500 supporters packed into the gymnasium at Wooster High School in Reno early Saturday morning to hear the senator make her presidential pitch. 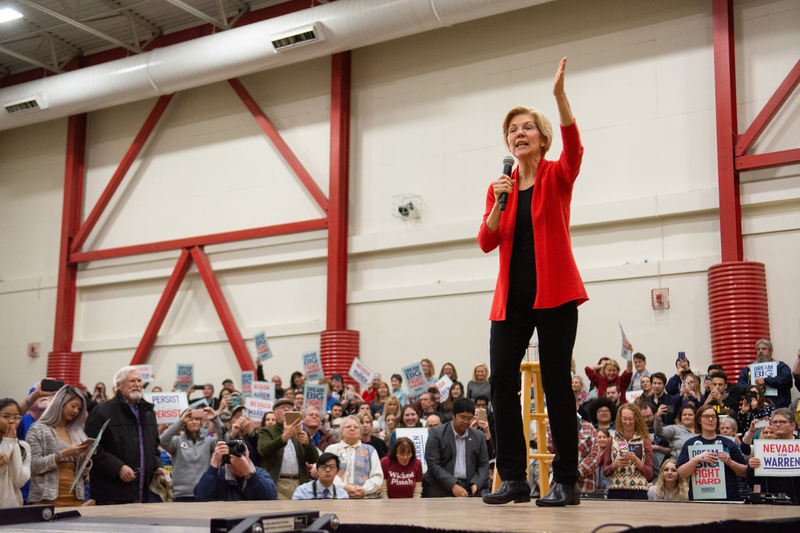 In a wide-ranging speech, Warren highlighted three campaign priorities: tackling corruption, rewriting the rules of the economy and protecting democracy. She also answered questions from a handful of audience members on issues including freedom of the press, the environment and criminal justice reform, stressing that the only way Democrats will win in 2020 is talking about the issues, not President Donald Trump. She drilled down into some of the specifics of her vision during her interview with the Independent, including her thoughts on anti-competitive practices, right-to-work laws and climate change. Asked whether the recently announced joint venture between Barrick Gold and Newmont Mining, the two biggest gold producers in the state, to mine together in Nevada raises anti-competitive concerns, Warren said it does. Barrick Gold had initially proposed a $18 billion hostile takeover of Newmont, and the two have now agreed to coordinate their gold mining efforts in the state. Asked whether repealing right-to-work laws that prevent union membership from being required as a condition of employment should be a central tenet of the Democratic Party, Warren, who has long opposed such laws, said it should. Warren committed to not funding a high-level nuclear waste repository at Yucca Mountain, something Trump has repeatedly included in his budget. “It’s a seismically unstable area, and storing nuclear waste there would be a threat to our country,” Warren said. She also supports consent-based siting — that is, community buy-in where the waste will be stored — and suggested that the country find a location that is “stable and distant from population centers” for its long-term nuclear waste storage problem. Warren detailed a two-pronged approach to mitigating wildfires and drought in the West: moving climate change up on the federal government’s action agenda and allocating additional congressional resources to fire prevention and water management. She said she’s been “shocked” to see Congress reluctant to boost resources for firefighters. As states have stepped up to tackle the high costs of prescription drugs, including Nevada with its first-in-the-nation diabetes transparency law in 2017, Warren said there is more the federal government needs to be doing, too. She said the federal government could permit the importation of drugs from Canada that meet safety standards, negotiate drug prices for Medicare and intervene in the generic drug market, a proposal Warren has backed with recent legislation. The bill would allow the federal government to shepherd the development of a generic drug once a brand name medication goes off patent. 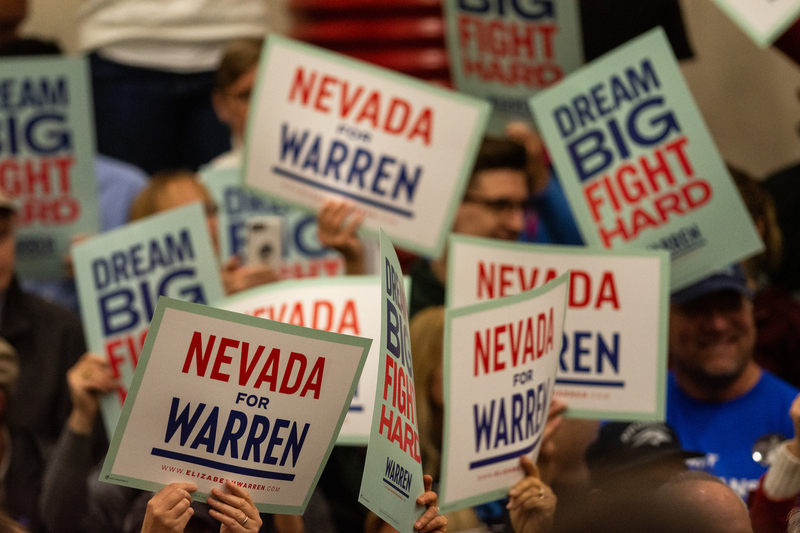 The Reno campaign stop marked Warren’s second trip to Nevada since formally launching her presidential campaign two months ago. She rallied supporters at the Springs Preserve in Las Vegas in February. The Nevada Independent is tracking presidential hopefuls’ swings through the Silver State through our presidential candidate tracker. Check it out for the latest information on candidate visits to the state.